With the Giant Soccer Ball Pool summer will be just for kicks! This inflatable toy is designed like a giant soccer ball and is perfect for the beach, swimming pool or park. 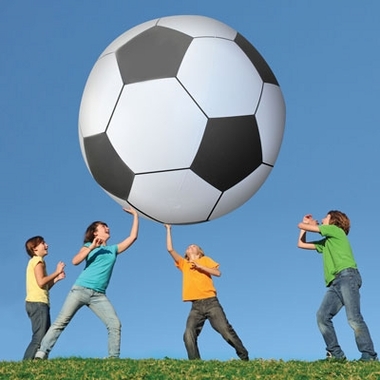 At over 6 feet tall, this gigantic soccer ball of fun will turn heads and delight the whole family! This item is made of durable vinyl. For ages 15+. Availability: The Inflatable Soccer Ball Float takes approximately 1 business day to leave the warehouse. Note: This item cannot ship to PO Boxes, APO Addresses, Alaska or Hawaii.